I imagine there will be quite a bit of gift wrapping going on over the next couple of days. Perhaps you're looking for a way to decorate those packages and these gift toppers might fit the bill. But if your holiday gifts are already all wrapped up, consider making one of these on other gifts you give throughout the year. Requiring only a length of ribbon, one or two buttons and a piece of embroidery floss, they are are quick -- about 6 minutes each -- and easy to make. Since I mail Christmas presents, I try to come up with cute wrapping that can be crammed into a box for sending and then will still look nice under the tree once they arrive at their destination. I also aim to make gift toppers that can be saved and reused. According to my cousin, the packages I sent to her two children arrived in great shape. I got a kick when she quoted her nine year old son Owen -- "Louise is such a fancy wrapper, I love her stylish wrapping!" - A 12 inch piece of embroidery thread. - One or two buttons. If using two, they should layer together, one on top of the other, nicely. 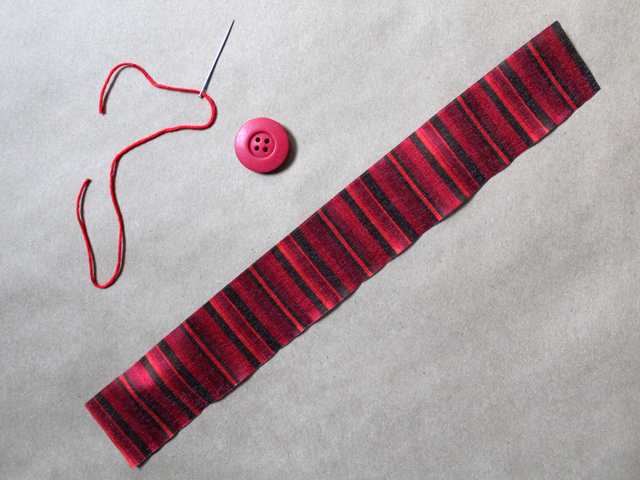 (1) Thread your needle and hand-sew along one side of the ribbon, with small in an out stitches. (2) Move the ribbon on the thread so that it's all squashed together (please see the pictures to see what I'm trying to say). 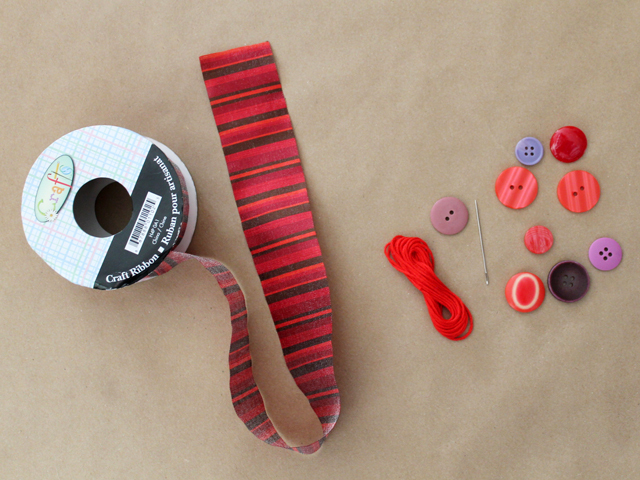 Adjust the thread so you have the same length free at the beginning and end of the gathered ribbon. 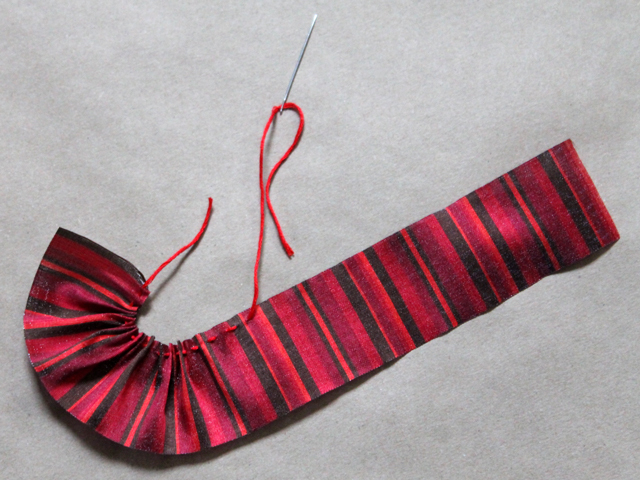 (3) Tie the two ends of thread together in a good knot. (4) Thread one end and pass it up and through the holes on the button(s). 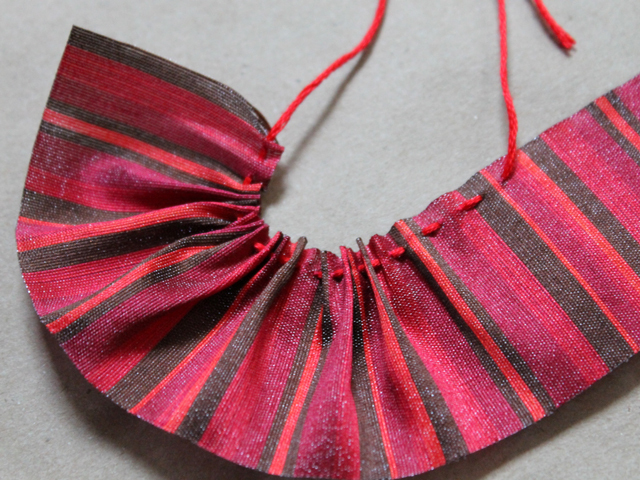 Then pass it back through the hole formed in the centre of the ribbon gathers. (5) Repeat with the second end of the ribbon, going up and back through the button holes and through the centre hole in the ribbon piece. (6) Tie another good knot. (7) Use the two tails of thread to tie your decoration to ribbon of yarn on your package, or tape the ends down onto the gift. Thanks for checking out my post. If you're celebrating, I hope you're having a happy holiday season. Such a great gift topper, and so much prettier than a typical store bought bow- I love this idea! 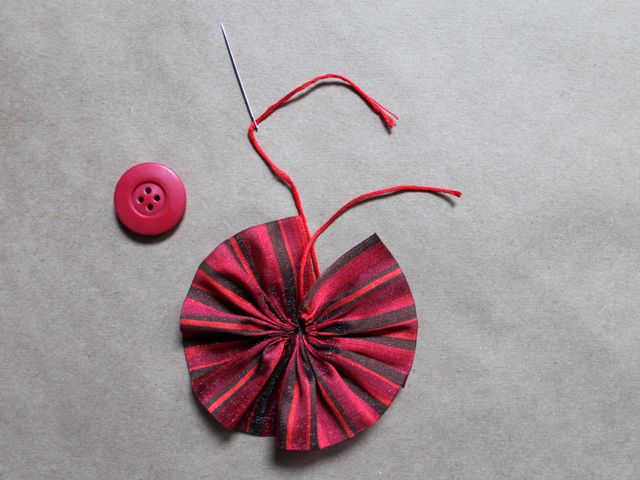 What a great tutorial for a neat gift topper! Thanks for sharing! I’ve got so many buttons I’ve really got no excuse not to copy your wonderful idea, I’ll have to save it for next year though, for once in my life I’m wrapped and ready! Um, YES! 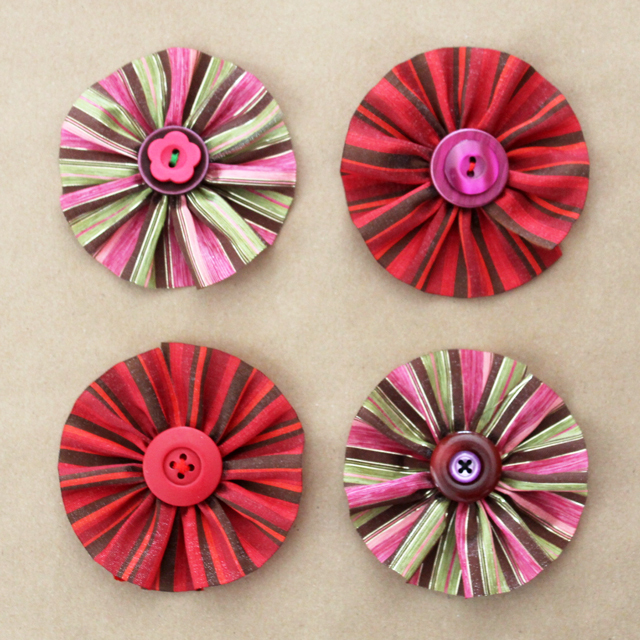 I will be totally be making some of these to make some brooches and headbands for baby girl!! PINNING!! Nice ideas. I am reading your blog and you share the tutorial is awesome. It’s a very useful. Thanks for sharing this so interesting post! I really want to be thankful for the way you have put it here.